This image from NASA's Cassini spacecraft shows Saturn's moon Tethys disappearing behind Titan as observed by Cassini on Nov. 26, 2009. Tethys is about 660 miles (1,070 kilometers) across. On Aug. 17, 2015, NASA's Cassini spacecraft captured this image of Odysseus crater with its ring of steep cliffs and the mountains that rise at its center, the most visually striking feature on Saturn's icy moon, Tethys. 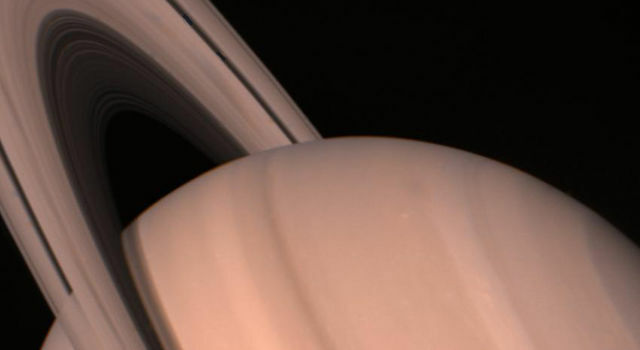 Saturn's rings cast dark bands across cloud tops in the northern hemisphere. Near the pole, an elongated shadow can be seen from Saturn's moon Tethys. Icy moons Dione (front right) and Enceladus (back right) are also seen by NASA's Cassini spacecraft. On March 13, 2006 Cassini's narrow-angle camera captured this look at Saturn and its rings, seen here nearly edge on. The frame also features Mimas and tiny Janus (above the rings), and Tethys (below the rings). NASA's Cassini spacecraft shows the low angle of the sun over Tethys' massive canyon, Ithaca Chasma (near the terminator, at right), highlights the contours of this enormous rift. Tethys, one of Saturn's larger icy moons, vaguely resembles an eyeball staring off into space in this view from NASA's Cassini spacecraft. The resemblance is due to the enormous crater, Odysseus, and its complex of central peaks. Shadows cast across Mimas' defining feature, Herschel Crater, provide an indication of the size of the crater's towering walls and central peak, as seen by NASA's Cassini spacecraft. Saturn's moons Tethys and Hyperion appear to be near neighbors in this view from NASA's Cassini spacecraft, even though they are actually 930,000 miles apart here. Tethys is the larger body on the left. An illusion of perspective, Saturn's moon Tethys seems to hang above the planet's north pole in this view from NASA's Cassini spacecraft. he view from NASA's Cassini spacecraft looks toward the anti-Saturn sides of Tethys and Rhea. North on both moons is up. Rhea and Tethys are medium-sized moons that are large enough to have pulled themselves into round shapes. Two of Saturn's moons, Tethys and the much smaller Janus, are captured in this photo from NASA's Cassini spacecraft. Three of Saturn's moons, Tethys, Enceladus and Mimas, are captured in this group photo from NASA's Cassini spacecraft. Saturn's moon Tethys appears to float between two sets of rings in this view from NASA's Cassini spacecraft, but it's just a trick of geometry. The rings, which are seen nearly edge-on, are the dark bands above Tethys. Saturn's moons, like Janus, irregularly shaped bodies, and Tethys, spherically shaped, demonstrate the main difference between small moons and large ones. It's all about the moon's shape. NASA's Cassini spacecraft captured Saturn, around 10 times the diameter of Earth, dwarfs it retinue of moons. Tethys is seen here at lower right. Like a cosmic bull's-eye, Enceladus and Tethys line up almost perfectly for NASA's Cassini. Since they are also at relatively similar distances from the spacecraft, their apparent sizes in this image are a good approximation of their relative sizes. Tethys, dwarfed by the scale of Saturn and its rings, appears as an elegant crescent in this image taken by NASA's Cassini Spacecraft. Views like this are impossible from Earth, where we only see Saturn's moons as (more or less) fully illuminated disks. The night sides of Saturn and Tethys are dark places indeed. This image from NASA's Cassini spacecraft shows shadows are darker areas than sunlit areas, and in space, with no air to scatter the light, shadows can appear almost totally black. This enhanced-color mosaic of Saturn's icy moon Tethys shows a range of features on the moon's trailing hemisphere. This image from NASA's Cassini spacecraft was constructed from 52 images from its narrow-angle camera on April 11, 2015. Unusual arc-shaped, reddish streaks cut across the surface of Saturn's ice-rich moon Tethys in this enhanced-color mosaic from NASA's Cassini spacecraft. This enhanced-color mosaic from NASA's Cassini spacecraft of Saturn's icy moon Tethys shows a range of features on the moon's trailing hemisphere. The giant impact basin Odysseus on Saturn's moon Tethys stands out brightly from the rest of the illuminated icy crescent as seen by NASA's Cassini spacecraft. In Greek mythology, Dione was the daughter of Tethys. Scientists believe that they formed out of the same disk around an early Saturn. NASA's Cassini spacecraft sees the two eponymous moons together. In this image from NASA's Cassini spacecraft, two large craters on Tethys, near the line where day fades to night, almost resemble two giant eyes observing Saturn. Tethys is significantly closer to the camera, while the planet is in the background. Like most moons in the solar system, Tethys is covered by impact craters. Some craters bear witness to incredibly violent events, such as the crater Odysseus (seen here at the right of this image from NASA's Cassini spacecraft). NASA's Cassini orbiter shows that Tethys appears to be peeking out from behind Rhea, watching the watcher. Scientists believe that Tethys' surprisingly high albedo is due to the water ice jets emerging from its neighbor, Enceladus. NASA's Cassini orbiter shows Saturn is circled by its rings (nearly edge-on in this image), as well as by the moons Tethys (the large bright body near the lower right corner) and Mimas (seen as a slight crescent against Saturn's disk above the rings). This set of global, color mosaics of Saturn's moon Tethys was produced from images taken by NASA's Cassini spacecraft during its first ten years exploring the Saturn system. This set of global, color mosaics of Saturn's moon Mimas was produced from images taken by NASA's Cassini spacecraft during its first ten years exploring the Saturn system. The moons visible in this image from NASA's Cassini spacecraft, Pandora and Atlas, are quite small by astronomical standards, but the rings are also enormous. From one side of the planet to the other, the A ring stretches over 170,000 miles (270,000 km). Like a drop of dew hanging on a leaf, Tethys appears to be stuck to the A and F rings from this perspective of NASA's Cassini spacecraft. NASA's Voyager 2 spacecraft made its closest approach to Saturn 35 years ago. The Cassini mission has followed up on many of Voyager's discoveries. 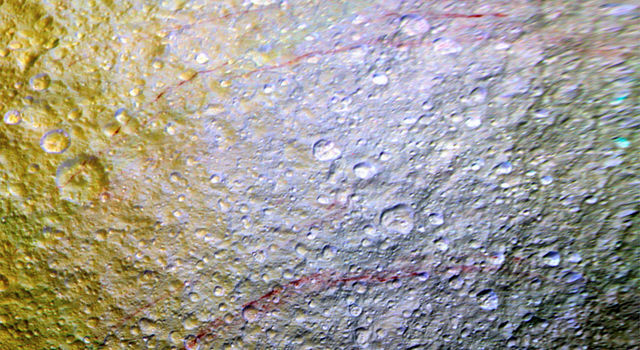 Unexplained arc-shaped, reddish streaks are visible on the surface of Saturn's icy moon Tethys in new, enhanced-color images from NASA's Cassini spacecraft. 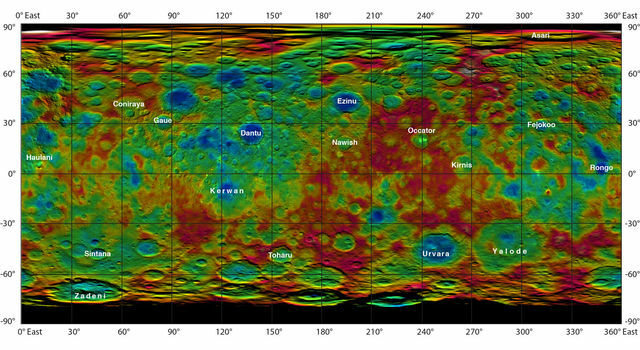 Colorful new maps of Ceres, based on NASA's Dawn spacecraft data, showcase a diverse topography, with dramatic height differences between crater bottoms and mountain peaks.